“I think that an exciting trend in resistance training will be a further move towards more “Asymmetrical and Alive” types of training. Let me explain “Alive” – let’s say you can deadlift 100lbs. Now try to pick up a 100lb child who doesn’t want to be picked up! It’s an entirely different type of strength – one that grapplers and mixed martial artists can attest to.” I would love to say that the above quote was mine, but it comes from the mind of internationally renown Strength Coach, Alwyn Cosgrove. Just lifting awkward and odd implements isn’t the only idea behind Mr. Cosgrove’s theory. It is how we specifically create progressive and purposeful programs using these concepts. Remember, the tools are one thing, but knowing how to use tools is far more important. Let’s examine how we can use these ideas and make them into practical workouts. What is asymmetrical training? This is where the body is loaded upon one side. Why do we care about such training? Spinal performance and health expert, Dr. Stuart McGill feels similar to Coach Cosgrove. In Dr. McGill’s opinion, asymmetrical loading is important as it “uniquely challenges the lateral musculature (quadratus lumborum and oblique abdominal wall) in a way never possible with a squat. Yet this creates necessary ability for any person who runs and cuts, carries a load, and so on.” If we extrapolate this idea to the world of combative athletes we see a need for asymmetrical loading to even a higher degree! Before you leave all bilateral training behind, understanding how to progress, cycle, and implement these ideas are very important. Asymmetrical training drains our nervous system to a high degree and needs to be progressive. Using a combination of bilateral and asymmetrical loading patterns is ideal. In our Dynamic Variable Resistance Training (DVRT) system, we can create asymmetrical loading in four different ways. Enough theory, let’s talk about how to construct programs to address these concepts. In order to appropriately use asymmetrical loading we are going to look at cycling this idea within specific movement patterns. You can see how we can accomplish this goal with the two workouts described below. These would be ideal for combative athletes and combine strength, stability, power, and conditioning. How we do this needs to be very well thought out or it can cause overtraining or lack of progress in any of these goals. 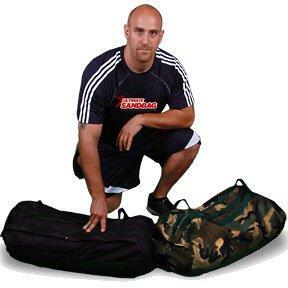 Josh Henkin, CSCS is the creator of Dynamic Variable Resistance Training and the Ultimate Sandbag. He is on the board of advisers for the Mixed Martial Arts Conditioning Association as well as designing programs for US Army Special Forces Recruiting Battalion, Fire Departments, and SWAT Teams. More information on the DVRT system can be found at DVRTFitness.com. NEW Online DVRT Certification is LIVE!